I have never been a good sleeper. Never. Even when I was little I remember lying awake for hours every night. Usually I just can’t shut my brain off, and oftentimes anxiety exacerbates it. 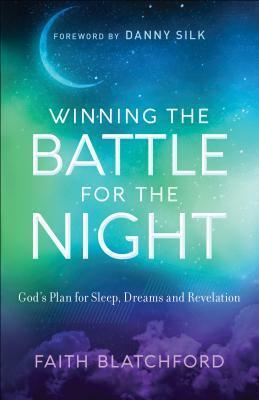 When I heard about Winning the Battle for the Night by Faith Blatchford, I got really excited. I truly hoped that I would be able to find answers to help me sleep better. In our fast-paced world, we see sleep as “wasted time,” or else we lie awake as anxiety, fear, or distractions run through our minds. That was never God’s intent for the night. Without realizing it, we’ve handed this sacred time over to the enemy. With warmth, compassion, and keen biblical insight, counselor and speaker Faith Blatchford reveals that it’s during this precious time that God imparts everything necessary for us to be equipped for the day. Without peaceful sleep at night, we are robbed mentally, physically, emotionally, and spiritually of the resources we need. God created the night and the dark–and he called it good. He dwells in it. The dark does not belong to the devil, so don’t let the enemy steal it from you. Here are the tools you need to take back your night, to encounter the God of rest, and to sleep peacefully the whole night through. As I stated above, I do not sleep well. I want to, but I’m not good at it. Going to sleep is the hardest part. My brain does not shut off. And anxiety usually exacerbates the problem. I saw this book on Netgalley and got super excited. Finally I might be able to get answers! Then I got into the book and found a different story. This book does talk a little bit about insomnia and not sleeping well, but mostly it discusses dreaming. Faith Blatchford didn’t dream when she was growing up, and it bothered her. She spent a long time talking to other people and trying to figure out why she didn’t dream. I don’t really care about that, as much, but it was interesting. Ms. Blatchford delves into scriptures and discusses dreams told in scripture from God to prophets. This is a very Christian book. It’s all about prayer, scripture, and making yourself worthy to receive dreams. If you want to dream, and receive inspiration for your life through dreams, then this book is for you. She’s done her research, that’s for sure! Start by giving yourself enough time to sleep, setting a routine, and turning off the screens. Don’t have caffeine before bed, and get rid of all negative thoughts and energy, are a few of the first steps to dreaming. Keep paper and pen by your bed so you can record your dreams, and then ask God the meaning of your dreams. Although this book did not really answer the questions I had, I did find it interesting. Will I put forth the effort to learn how to dream? No, probably not right now, but maybe I will in the future. I am Christian and am familiar with most of the scripture stories in Winning the Battle for the Night. I am also familiar with a lot of the Christian advice. One thing I disliked was that she tended to tell as truth things that we don’t know for sure. And she almost makes it seem like you’re not a good Christian if you’re not receiving inspiration from God in your dreams. In my opinion, I feel like receiving inspiration through dreams is a spiritual gift that not everyone has. However, if it’s something that you can learn, then this book will be a great resource to those who want to learn that skill.